Talking powerful program-calendar for any reminders with calendar and weather forecast on your desktop. Actual Reminder can pronunciation in voice any reminder and can tell to you about the weather outdoors. Actual Reminder can also inform you about the holidays for the current day in different countries. Automatic shutdown pc, Reminding thru E-mail, E-mailing birthday greetings, printable calendar and many other functions. It's 100% free to try! 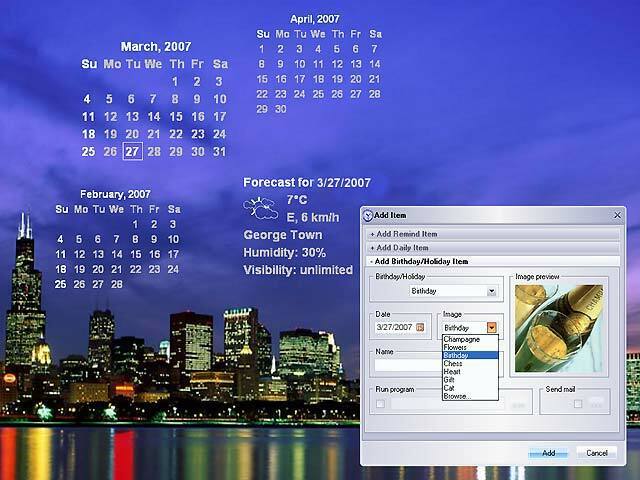 Best talking reminder software with desktop calendar and weather forecast. Qweas is providing links to Actual Reminder 3.0.9 + Weather as a courtesy, and makes no representations regarding Actual Reminder or any other applications or any information related thereto. Any questions, complaints or claims regarding this application Actual Reminder 3.0.9 + Weather must be directed to the appropriate software vendor. You may click the publisher link of Actual Reminder on the top of this page to get more details about the vendor.